Bringing home a movie merchandize is one of the most common methods through which fans try to show off their dedication to their favorite actor or a specific character. 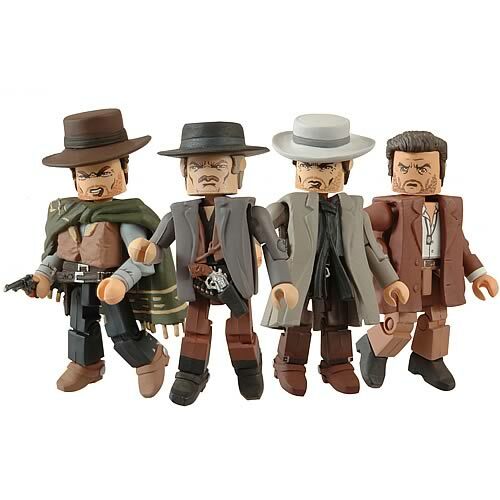 And with this The Good, The Bad, and The Ugly Minimates Box Set, the flick’s fanatics get yet another opportunity to show to the world how much they loved the showdown scenes, and the wild, wild western duels, all encompassed with loads of giggles and laughs. People may classify these collectibles as good or bad, but surely not ugly. Clint Eastwood fans are, no doubt, gonna love this and fans like me wouldn’t even mind paying the $16 by breaking our budget-cut piggy banks, if we have to. The cutely sculpted wood figurines featuring 14 points of articulation each, and about 2 inches in height present the Good Blondie, the Bad Angel Eyes, and the Ugly Tuco, along with the Showdown Blondie from the final standoff in a never before seen avatar. All you need is some wild imagination which includes a wild wild west scenario and this minimates box set to relive the magic that the 1966 classic presented the audience with. Other such similar items that you may like to familiarize yourself with are the Batman slot car race track set and the Star Wars Darth Vader’s TIE fighter.